One of the most difficult and profound things in life to go through is the death of a loved one. Whether that person happens to be your mother, father, brother, sister, or a grandparent etc., the loss of someone close to you comes with an overwhelming range of emotions, from sadness and sorrow, to stress and confusion. When a family member or friend dies, it can immediately feel like there are a million tasks that need to be handled and this is most often indeed the case. Whether these tasks include notifying family members and acquaintances of the death, or having to identify and gain access to various accounts in the loved one’s name, the amount of paperwork and miscellaneous things to oversee can be incredibly overwhelming. During this process and while continuing to grieve, family members often realize that they want to preserve memories shared between themselves and their loved one who is deceased. The primary way of doing this is by attempting to save communication they’ve had with that individual. This can mean printing out recent emails, locating photos either on their computer or in the loved one’s home, and also figuring out a way to save the text messages and voicemails from the loved one’s phone while the device is still active and accessible. Here at Decipher Tools Headquarters in San Francisco, we receive emails from iPhone users throughout the year inquiring about how best to preserve the text messages they exchanged with someone who has passed away. Text messaging has become one of our most used forms of communication in recent years, with over 22 billion texts being sent worldwide every day in 2017 thus far! Often contained within these SMS messages are precious memories, including photos and videos. The need to save and preserve these memories and communications is becoming more commonplace every year, especially as we build up a history of SMS messages over time on our mobile devices with friends and family. 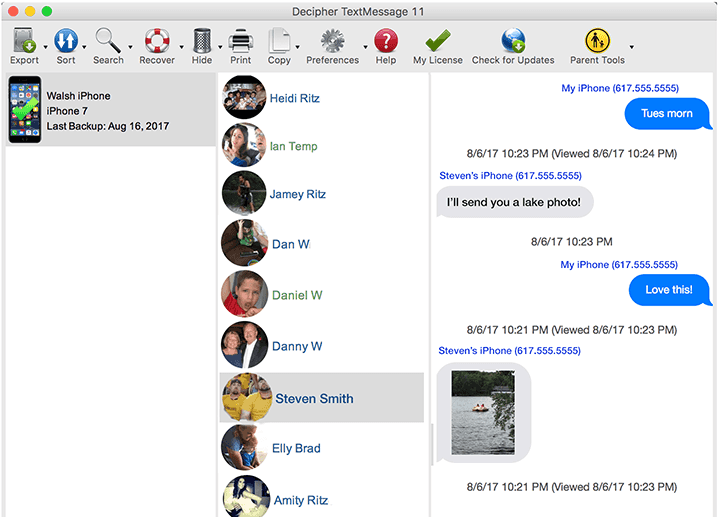 With Decipher TextMessage the ability to save the text messages and iMessages of a loved one who has died has never been easier. Doing so will also hopefully help ease some of the pain that comes with the passing of someone close to you. The following step-by-step guide is for iPhone, iPad, or iPod Touch users who have a Mac or Windows computer, and want to preserve text messages, either from the loved one's phone or from one's own device. Step 1. Backup your iPhone via iTunes. Step 2. Download Decipher TextMessage on your computer. Step 3. Select a device and choose a contact. Step 4. Click Export from the menu. The free trial version of Decipher TextMessage requires no payment and you can run the trial as long as you like. The trial version enables you to save, export, and print a few messages from each contact, and the software will give you a good feel for the program and its ease of use. To export all the messages from a specific iPhone contact, you can upgrade to the full paid version of the software. After exporting text messages, many people like to also print out the saved messages, either for themselves, for a family member, or to archive for safekeeping. Exported messages will also contain any photos or video attachments that were part of the conversations with your loved one. Step 1. Located the exported messages folder on your computer. Step 2. Open the exported html file in your web browser. When you print out your exported text messages, the messages will be displayed in iOS “chat-bubble” format just as they appear on your iPhone or iPad. You can then save the print outs in PDF format if you need to email the exported text conversations to other family members or friends. The saved messages will remain in Decipher TextMessage on your computer ongoing and all your personal data is private and stored locally on your machine. Only you have access to your data. Even if your loved one's passing was not a recent occurrence, text messages are often still accessible years later. In order to save the messages you would access either to the iPhone or to the computer where your loved one backed up their iOS device via iTunes. The death of a parent, partner, sibling, or other loved one is one of the most profound things anyone will experience during their lifetime. If you want to make sure that your text messages with your mother, father, grandparents, or anyone on close to you are preserved for you and your family, it only takes a few minutes out of your day to transfer the messages to your desktop or laptop computer. By archiving the messages off of the device, either to your computer or to an external hard drive, it will ensure that your personal communications and memories with your loved one will be safe and sound for years to come. If you have any questions about accessing iPhone text messages or iMessages with someone who has passed away, feel free to contact us anytime via our Decipher Tools support page. We a USA based company and we respond to everyone. We're always happy to help or field questions regarding your own specific iPhone text message archiving needs.